Zemedkun Ketema is 14 years of old. 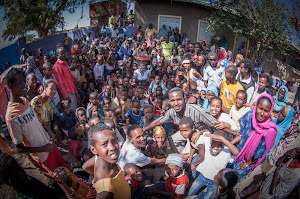 He lost both parents due to HIV/AIDS.After his parents died, Zemedkun started living with his uncle in Dire Dawa. Though Zemedkun is not forced to live on the streets, he lives in a situation of dire poverty. His uncles family earns very little money, and find it very hard to provide for their own children let alone their nephew. Currently he is attending grade 7 at the nearby secondary school. Zemedkun has been selected by the project to receive psycho social support. Like other target children he gets all the services provided by the project. Zemedkun said that “since I am targeted by the project, my motivation to education has been improved significantly. Now I am very happy to learn my education. I have good place to study and play' What more could we ask for?